The Essex Farm Institute is a program of the Adirondack Council. 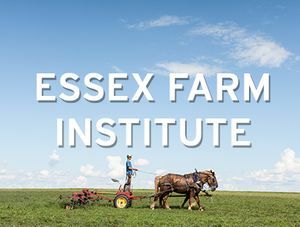 At EFI, we seek to teach sustainable farming practices to self-identified beginner farmers. With your help, we are creating opportunities for these entrepreneurs to come learn new techniques, share ideas, and establish farming methods that are environmentally, socially, and economically viable. We envision a future where farms power themselves, their community and the world from the energy of the sun.